For several months now, I’ve seen references to Joe’s Diner in historic East Durham. I drove by once to make sure I knew where it was;then, about a week ago, I decided to give it a try. Joe’s diner is located at the corner of Angier Avenue and Driver Street in a commercial area that has seen brighter days. Joe's Diner,though, hints that the worst of days has past and the area is back on the rise.Certainly, the hip foodie chatter I’ve heard won’t hurt. I arrived early enough to try a combination of items from the breakfast and lunch menu. After discerning the ordering protocol, I placed my order at the cash register, found a seat, and waited. After a moderate wait, my food arrived. The breakfast left me uninspired, but I’m here to talk about hot dogs. I had the Judge Dog, originally ordered without ketchup, but served with ketchup, after all. The wiener was pretty big and dense, the kind that snaps when you bite it. Even among all-beef dogs, this was more a deli-dog than a skinless Nathan’s, Hebrew National, or Sabrett’s. The slaw was fresh and tasty. The chili had a good flavor, but it wasn’t meaty like a Carolina Dog would normally be. 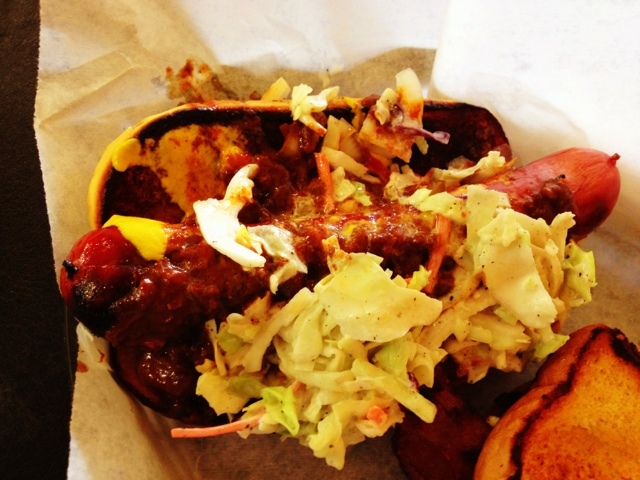 A large bun accommodated the wiener and generous toppings,and the whole thing required a knife and a fork. The prices were pretty staggering. The cheapest dog is a basic hot dog for $2.50. Most of the dogs are quarter pounders, and they ring in at $4.25 and up. They ARE bigger, and they are all beef, but the prices seem steep for a hot dog. I thought the Judge Dog would be the closest to a Carolina Dog, and it may be, but it really wasn’t a Carolina dog. For the concoction it was, I thought it was pretty darn good, but compared to a Carolina Hot Dog, I felt it fell short. My verdict 3 out of 5 weenies.